Goodbye Google Reader, hi Feedly! I will not waste your time and just tell you which alternative I’ve chose – it’s Feedly. And the reasons of my choice are very simple: Feedly has a wonderfull user interface (for the first sight it’s a bit too fancy, but it’s easy to switch from magazine to condenced layout which is very close to the G.Reader’s one), has clients for iOS, Adnroid and Kindle Fire and, last but not least, will import all your feeds and starred items (they can be found as “Saved” ones in Feedly). There are few missing things of course, for example there is no way (yet) to send a post from Feedly to SendToReader the same way we do that in Google Reader, but I hope it’s a temporary problem. And you can help me to resolve it. 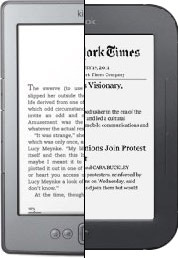 There are many similarities and differences between the Kindle and Nook tablets. It’s a bit like comparing cars or other giant corporations who strive to be the best in their particular market. For example, comparing a Chevrolet and a Ford. Each has various features and benefits that make one more appealing to people than the other. It’s a matter of taste. But still, there are some significant differences making one of them way more useful. Interested? Continue reading. For those people who, like me, want to know everything about Kindle and other e-reading devices, who want to be informed about every single event in this industry, here is the list of my favorite blogs about Amazon and Kindles. Best of all, you don’t need to visit all those blogs to read their posts. Instead, subscribe to this free daily periodical and receive on your Kindle the most recent news from all those blogs in a single, easy to navigate Kindle newspaper every morning. No longer do you have to lug a lot of textbooks around. Nor do you need to remember to grab a book to read on the train trip to work. Instead, all you need is to have your Kindle Reader well-stocked and you have enough reading for more than a year. You can load up to 6,000 different items onto the Kindle Reader. You’re not limited to the ebooks purchased from Amazon or any other ebook seller. Using the innovative, new web application called SendtoReader, you can also send any webpage or article to your Kindle absolutely free of charge. Hi there! Welcome to the SENDtoREADER official blog. This is the first post in this blog, so I think it’s the best place and time to tell you a bit about the topics I’m going to write about here. First of all, it’ll be the topics describing new features of my web app, and containing the instructions on how to use them. Also it’ll be posts containing some tips and trics for Kindle e-book reader. Finally, I’m going to write about e-readers themselves (Kindle mostly) and everything related to them.